Today's lecture provides background in how we build up concurrency control primitives in traditional, non-distributed systems that have shared memory. We'll soon explore why these techniques won't work in distributed systems -- and learn about the techniques that do. Cooperating processes (or threads) often share resources. Some of these resources can be concurrently used by any number of processes. Others can only be used by one process at a time. The air in this room can be shared by everyone without coordination -- we don't have to coordinate our breathing. But the printer wouldn't be much use to any of us if all of us were to use it at the same time. I'm not sure exactly how that would work -- perhaps it would print all of our images superimposed, or perhaps a piece here-or-there from each of our jobs. But in any case, we would want to do something to coordinate our use of the resource. Another example might be an interesection -- unless we have some way of controlling our use of an intersection (stop signs? traffic lights?) -- smack! The policy that defines how a resource should be shared is known as a sharing discipline. The most common sharing discipline is mutual exclusion, but many others are possible. When the mutual exclusion policy is used, the use of a resource by one process excludes its use by any other process. How do we manipulate a resource from within a program? With code, of course. The portion of a program that manipulates a resource in a way that requires mutual exclusion, or some other type of protection, is known as a critical section. We also noted that in practice, even a single line of HLL code can create a critical section, because one line of HLL code may be translated into several lines of interruptable machine-language code. Mutual Exclusion: Only one process can be in the critical section at a time -- otherwise what critical section?. Progress: No process is forced to wait for an available resource -- otherwise very wasteful. Bounded Waiting: No process can wait forever for a resource -- otherwise an easy solution: no one gets in. It is actually possible to synchronize an arbitrary number of processes within an operating system without hardware support. But, this is a tangled, ticklish, and generally unfortunate businesss. In practice, in order to implement a general-purpose solution in the real world, we're going to need a small amount of hardware support to implement very basic concurrency control primitives, from which we can build up richer abstractions or simply correct, easily readable solutions to straight-forward problems. One rudimentary form of synchronization supported by hardware is frequently used within the kernel: disabling interrupts. The kernel often guarantees that its critical sections are mutually exclusive simply by maintaining control over the execution. Most kernels disable interrupts around many critical regions ensuring that they can not be interrupted. Interrupts are reenabled immediately after the critical section. Unfortunately, this approach only works in kernel mode and can result in a delayed service of interrupts -- or lost interrupts (if two of the same type occur before interrupts are reenabled). And it only works on uniprocesors, becuase diabling interrupts can be very time-consuming and messy if several processors are involved. Another approach is to build into the hardware very simple instructions that can give us a limited guarantee of mutual exclusion in hardware. From these small guarantees, we can build more complex constructs in software. This is the approach that is, virtually universally, in use in modern hardware. One such instruction that is commonly implemented in hardware is test-and-set. This instruction allows the atomic testing and setting of a value. The semantics of the instruction are below. Please remember that it is atomic. It is not interruptable. 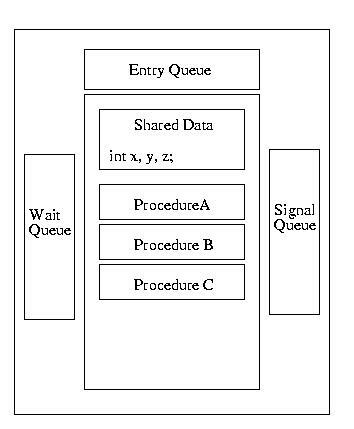 Given the test-and-set instruction, we can build a simple synchronization primiative called the mutex or spin-lock. A process busy-waits until the test-and-set succeeds, at which time it can move into the critical section. When done, it can mark the critical section as available by setting the mutex's value back to 0 -- it is assumed that this operation is atomic. Another common hardware-supplied instruction that is useful for building synchronization primatives is compare-and-swap. Much like test-and-set, it is atomic in hardware -- the pseudo-code below just illustrates the semantics, it is not meant to in any way suggest that the instruction is interruptable. Last class, we discussed fairly simple spin-locks. There are nice building blocks, becuase they can protect short critical sections with little contention while imposing very little overhead. Having said that, they cause a lot of busy waiting in the case of contention. And, that is a waste of resources. Today we'll talk about the condition variables, a synchronization primitive that helps us model events rather. The wait operation upon a condition variable always and immediately Because of this, when using condition variables, an additional mutex must be used to protect the critical sections of code that test the lock or change the locks state. We'll see how this all works momentarily. A monitor is a synchronization tool designed to make a programmer's life simple. A monitor can be thought of as a conceptual box. A programmer can put functions/procedures/methods into this box and the monitor makes him a very simple guarantee: only one function within the monitor will execute at a time -- mutual exclusion will be guaranteed. Furthermore, the monitor can protect shared data. Data items declared within the monitor can only be accessed by functions/procedures/methods within the monitor. Therefore mutual exclusion is guaranteed for these data items. Functions/procedures/methods outside of the monitor can not corrupt them. If nothing is executing within the monitor, a thread can execute one of its procedures/methods/functions. Otherwise, the thread is put into the entry queue and put to sleep. As soon as a thread exits the monitor, it wakes up the next process in the entry queue. The picture gets a bit messier when we consider that threads executing within the monitor may require an unavailable resource. When this happens, the thread waits for this resource, using the wait operation of a condition variable. At this point, another thread is free to enter the monitor. Now let me suggest that while a second thread is running in the monitor, it frees a resource required by the first. It signals that the resource that the first thread is waiting for becomes available. What should happen? Should the first thread be immediately awakened or should the second thread finish first? This situation gives rise to different versions of monitor sematics. The Java programming language provides support for monitors via synchronized methods within a class. We are assured that at most one synchronized method within a particular class can be active at any particular time, even in multi-threaded applications. Java does not require that all methods within a class be synchronized, so every method of the class is not necessarily part of the monitor -- only synchronized methods of a class are protected from concurrent execution. This is obviously an opportunity for a programmer to damage an appendage with a massive and rapidly moving projectile. Java monitors are reasonably limited -- especially when contrasted with monitors using Hoare or Mesa semantics. In Java, there can only be one reason to wait (block) within the monitor, not multiple conditions. When a thread waits, it is made unrunnable. When it has been signaled to wake-up, it is made runnable -- it will next run whenever the scheduler happens to run it. Unlike BH monitors, a signal can occur anywhere in the code. Unlike Hoare semantics, the signaling thread doesn't immediately yield to the signaled thread. Unlike all three, there can only be one reason to wait/signal. In this way, they offer simplified Mesa sematics. To wait for a condition, a Java thread invokes wait(). To signal a waiting thread to tell it that it can run (the condition upon which it is waiting is satisfied), a Java thread invokes notify(). Notify is actually a funny name -- normally this operation is called signal. The first example is a solution to the Bounded Buffer problem, also known as the Producer-Consumer Problem. This solution supports one producer thread and one consumer thread. Please notice that the producer signals a waiting consumer if it fills the first slot in the buffer -- this is because the consumer might have blocked because there were no full buffers. The consumer follows a similar practice if it takes the last item in the buffer -- there could be a producer blocked waiting for an available slot in a buffer. What follows is a fair solution to the reader-writer problem -- it allows the starvation of neither the producer, nor the consumer. The only tricky part of this code is realizing that starvation of writers by readers is avoided by yielding to earlier requests.